Dealers say Stefan Jacoby knew how to get things done in Wolfsburg. Volkswagen dealers in the United States say they're sorry to see Stefan Jacoby go. Partly it's because they like stability at the top. His successor will be the fourth CEO at Volkswagen of America since 2005. But mainly it's because they approve of the way Jacoby ran things. The 52-year-old German departed a month ago and is reportedly in line to head Volvo Car Corp. VW CEO Martin Winterkorn promises that Jacoby's replacement will be named soon. "It's disruptive," one VW dealer says. "Each new guy comes in with a new agenda." Jacoby started at Volkswagen in 1985 and spent time at VW of America in the late 1980s. He left in 2001 to run Mitsubishi's European operations and in 2004 returned to VW in Germany to head global sales. 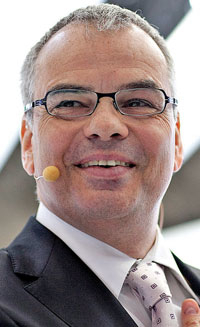 He became VW's top U.S. executive in September 2007. Dealers say Jacoby had the ear of senior management in Wolfsburg, Germany, and championed dealer causes. "He was nontolerant of the same old answers," says Wade Walker, president of Walker Volkswagen Motors Inc. in Montpelier, Vermont. Dealers cite an example of Jacoby's style. When retailers found that batteries on new vehicles had to be charged immediately after they came off the service carrier, they complained to Jacoby. A design flaw caused the battery to drain while being transported. When Jacoby found out, dealers say, he jumped on the problem and demanded that Germany engineer a change.